I have glorious childhood memories of summers spent at my grandparents' cottage in the lush, pine-filled northwoods of Eagle River, Wisconsin. My grandfather had a few hummingbird feeders placed outside the house, easily seen from windows. Often, while sitting at the dining room table, a hush would overtake our meal as we all sat in awe, viewing a tiny iridescent creature, delicately sipping the sugary maraschino cherry colored nectar (back then it was common to put red dye in the sugar water mixture). More recently, my husband and I purchased a beautiful piece of country property in the summer of 2007. The following spring, I drove our tractor over to the orchard. The freshly budding peach and apple trees needed tending to. As I switched the ignition off, I was distracted by a whirring buzz and rapid movement near the side of the machine. My eyes opened wide in amazement and delight! A diminutive female Ruby-throated Hummingbird was examining the bright yellow John Deere decal on the tractor's lift arm. She hovered a bit, moved closer, backed away, took note of the other yellow tractor markings and zipped off. Ecstatic with my precious sighting, I put the tractor in high gear and sped back to the shop, bucket clanking and dust trailing behind, to tell Bruce the exciting news. A few days later we placed three newly purchased feeders out on our acreage. To our pleasure we had several hummingbird visitors during the summer of 2008. The following spring, we hung seven feeders out in the country. Anticipating the hummingbird show, we packed picnic lunches and ate our meals down by the feeders. 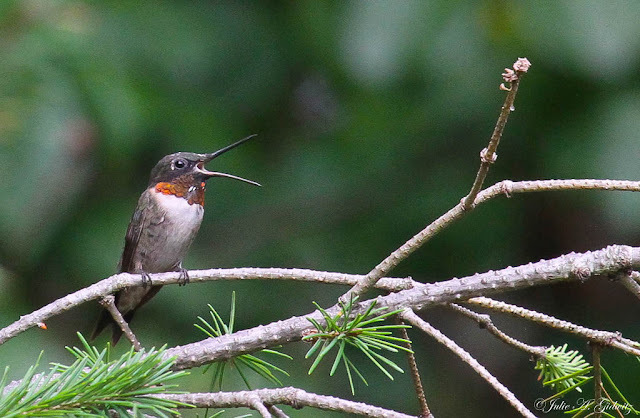 All summer long we were entertained and amused by the spectacular aerial displays and antics of the Ruby-throated Hummingbirds. We observed three or four tiny birds battling for ownership of each feeder. There were too many hummingbirds to count! Spring of 2009 arrived along with five new feeders. Our grocery bills increased too, with all the extra sugar purchases. Hummingbird eggs hatched and our numbers grew! Over the past few years we have had up to 15 feeders hung on our property. I have asked Bruce to stop me, no matter how much I protest, from hanging anymore feeders. So much of my time is spent cleaning and refilling them! I spot hummingbirds wherever I am on our land. With each sighting, a bright smile appears on my face. Many have become rather tame and will feed while I am only a foot or two away from them. My most cherished memory of a hummingbird happened two years ago. I was sitting on our ATV trying to photograph some of the feisty hummingbirds perched in the pines. I heard a familiar hum close to my ear and felt several whispery soft puffs of air against my neck. 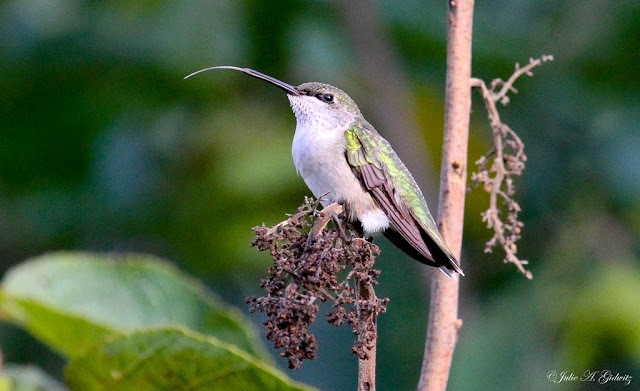 An especially tiny juvenile male Ruby-throated Hummingbird hovered beside me and then landed a foot away on the lip of a five gallon bucket in the ATV basket. This little fellow sat next to me for two minutes as I stared in amazement at his beauty. 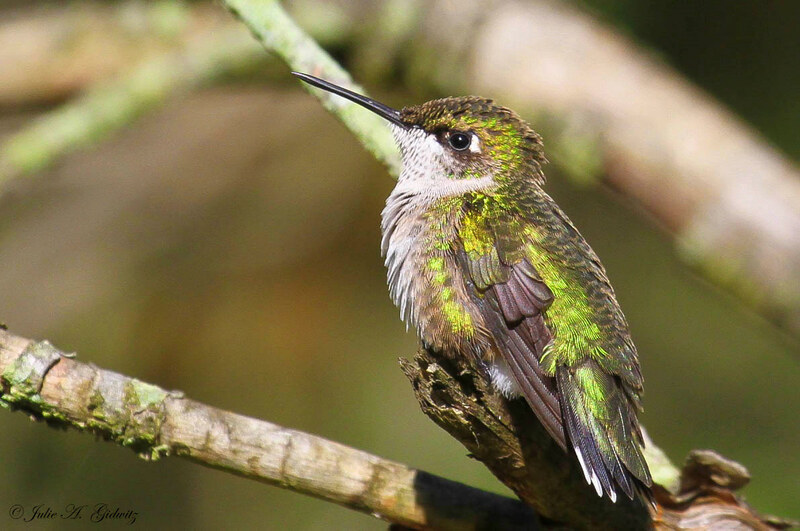 He looked at me, I looked at him, he observed other hummingbirds as they invaded territories and whizzed on past, chittering profusely. My mouth agape, I sat and noted his faintly emerging red gorget (throat) feathers, minuscule size, itty bitty feet and boldness to trust me. My new little buddy, sitting along side me, on a lovely summer day. 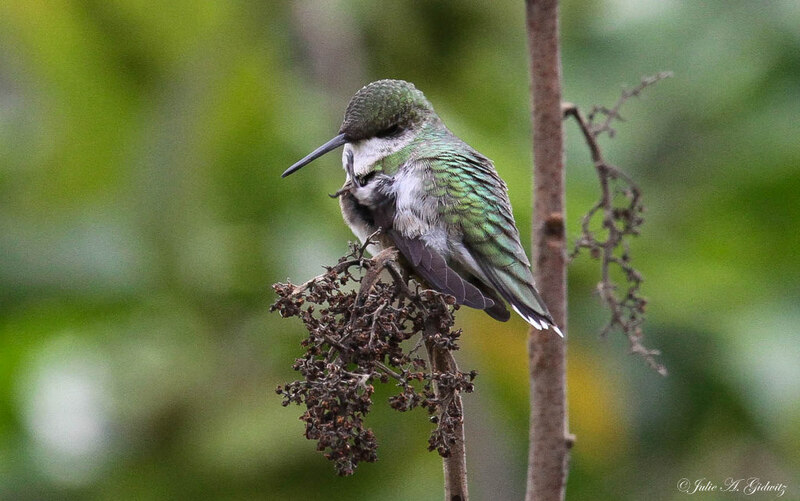 I finished composing this hummingbird post on Friday of last week. While eating lunch at our home in Chicago yesterday (Saturday), I noticed a female Ruby-throated Hummingbird feeding from one of our two feeders just outside the window. She had her fill and flew to a nearby magnolia tree and seemed to perch herself on a limb. I kept an eye on her and noticed she sat in the same spot preening for quite some time. I asked Bruce to take a peek and he thought she looked rather rotund. We brought out the binoculars to get a closer look. What we saw surprised and delighted us so! 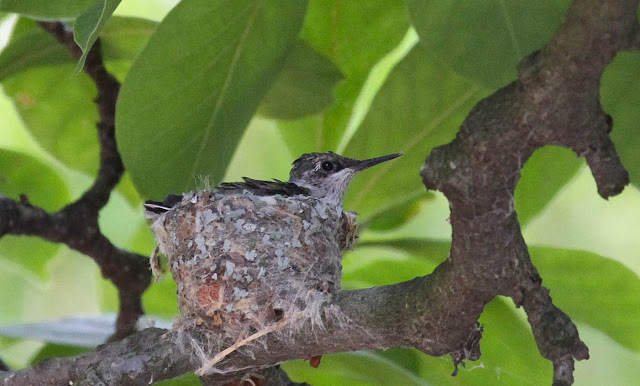 The female hummingbird was tending to her lone baby in a perfectly constructed nest. Joy! 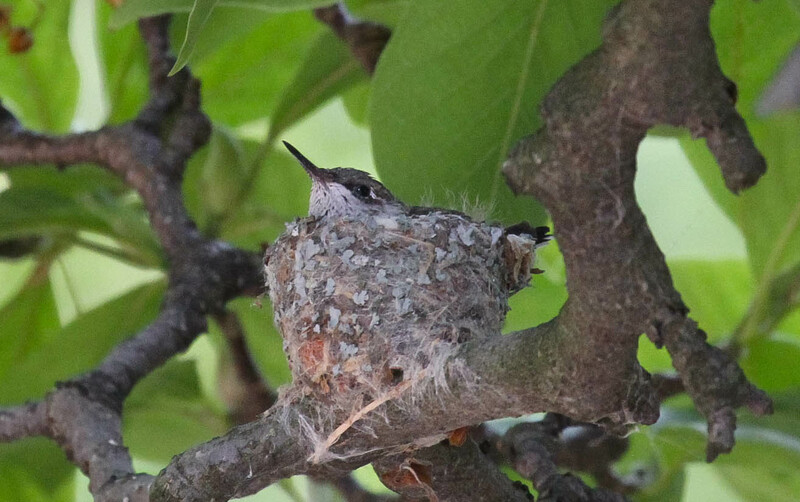 Ruby-throated Hummingbird nests are made up of material such as soft plant down, spider's silk, thistles, leaves and fireweed. They also weave lichen and moss into the nest and attach it to the outside. This nest and diminutive hummingbird withstood recent tempestuous thunderstorms and gale force winds. Lovely photos, and how lucky to have a nest in view. 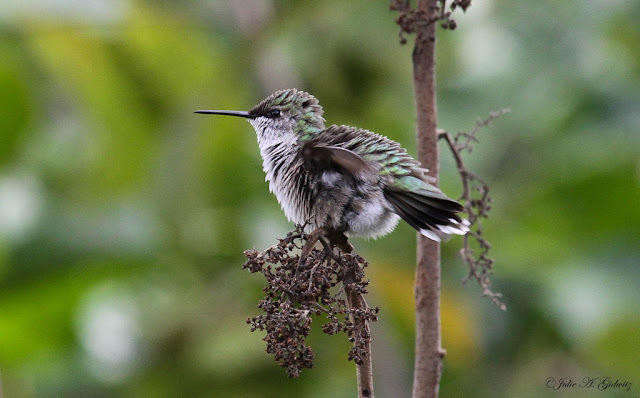 This is a terrific post Julie, I felt like I was there sitting beside you when the tiny male hummingbird perched so close to you. How wonderful to have so many of these flying jewels on your property! How delightful! I felt your excitement as I read! Wonderful post. 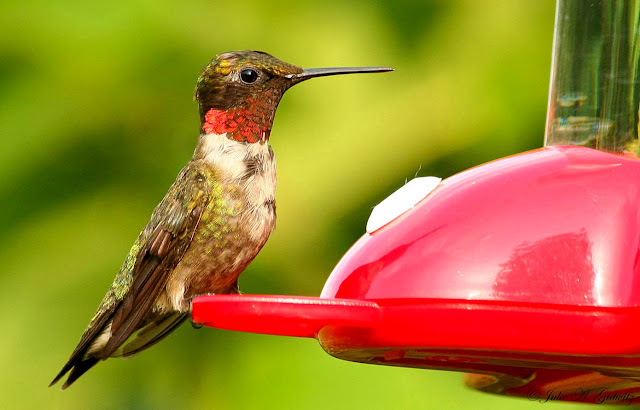 I, too, am captivated by hummers and never tire of watching them year around in my backyard in Tucson. Amazing observations and splendid photos, Julie. Wow! 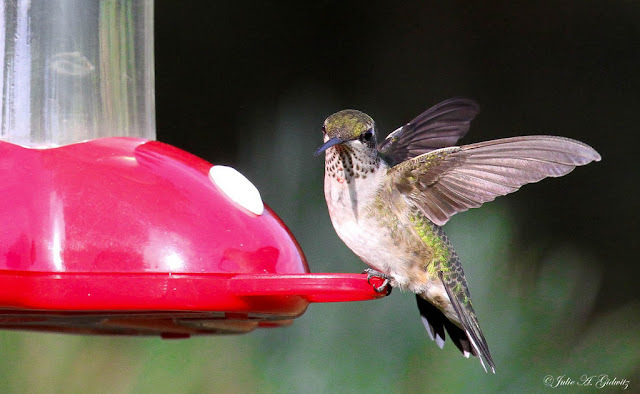 Your really captured the joy and amazement of hummingbirds. I had one perch on the brim of my hat once. Great photos too Julie! Wonderful shots and a great story too. They're such magical creatures...combining tenacity, boldness, grace, and fragility all into one tiny body with a heart that beats 300 times a minute! Thanks for sharing Julie. Very well written story. I really enjoyed reading it. Great photos as well. Looks like the hummingbirds will be an added bonus to your newly purchased country property. Perfect post and great photos!! I enjoyed this story, thank you :)! You are very lucky :))! Julie, it is very cool to have a hummer nest nearby. I loved all your photos and the hummingbirds. Happy 4th of July!